Not long after completing his honors undergraduate degree in Life Science from Queen’s University in 1994, Brian started a career as a Sales Representative for Patterson Dental. Through this experience, the encouragement of his Dentist clients, and the support/commitment of his wife and parents he entered Dental School in the fall of 2000. Dr. Brian Smith completed his Doctor of Dental Surgery Degree from the University of Toronto in 2004, graduating with Honors. 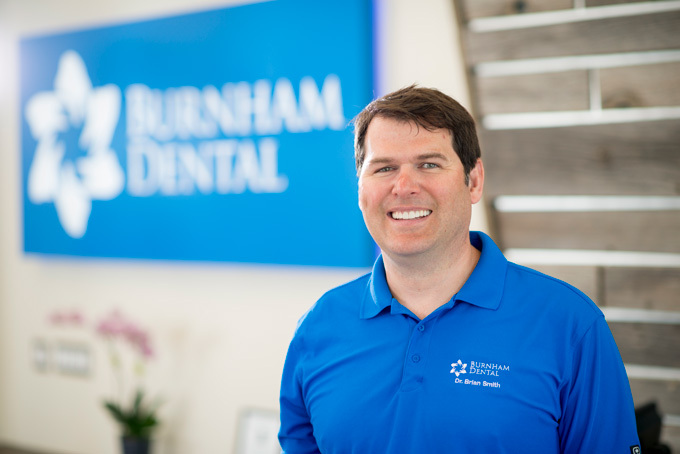 In 2005, Dr. Smith joined the Burnham Dental Team, first as an associate then as the owner. In February of 2006, he moved back to Peterborough with his wife Annelise and son Jake, having been born and raised here himself and a previous patient of the practice. Dr. Smith is committed to lifelong learning, and spends a great deal of time and money on continuing education, having recently completed courses in Oral Surgery, rehabilitative dentistry, implant placement and restoration, Occlusion/TMJ, and smile design/cosmetic dentistry. Dr. Smith is truly dedicated to his patients to deliver the very best quality dentistry possible. He likes to educate his patients about available treatment options so that they can make informed choices that are best for them. Dr. Smith is heavily involved in organized dentistry, he has represented Peterborough as the ODA Counselor for the Peterborough And District Dental Society. A past President of the Peterborough and District Dental Society and the Ontario Academy of General Dentistry, as well as a Past member of the Annual Meetings Council for AGD National Office in Chicago. Dr. Smith is a member of many professional organizations, including the Canadian Academy of Restorative Dentists and Prosthodontists, the Canadian Dental Association, the Ontario Dental Association, the Peterborough and District Dental Society, the Academy of General Dentistry, the American Academy of Cosmetic Dentistry. When he is not practicing dentistry, Dr. Smith enjoys bike riding, canoeing, hiking and nature photography. New....Watch a video introduction to Dr. Brian Smith just click on the image below.